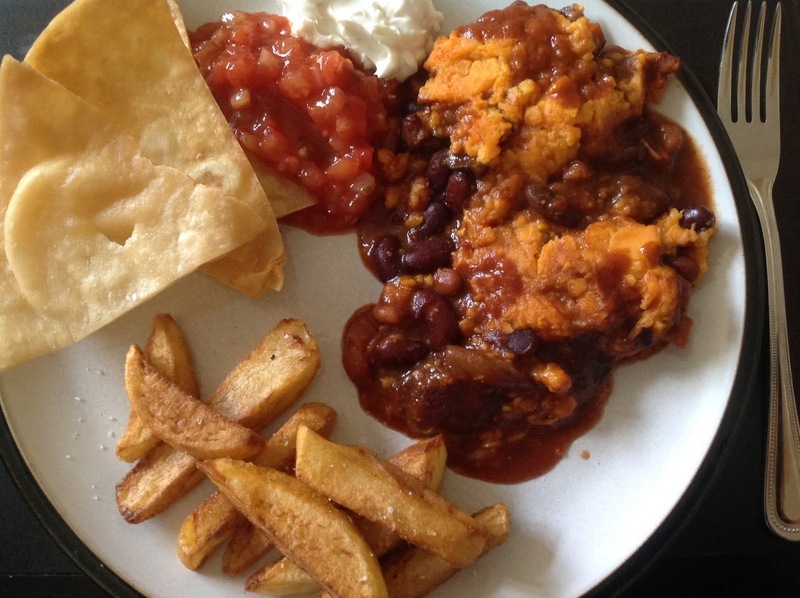 The Vegan Magpie: Feed a family of 4 for under £5 - Mexican bean pie! Feed a family of 4 for under £5 - Mexican bean pie! Hello! As part of my money saving ideas, here's a meal! I recommend making this the day after fajitas as any fajita mix left can go in the pie, as well as any left over wraps and dips being used! However, I've written this as if you haven't made fajitas last night! 3 medium sweet potatoes - 35p each, so recommend buying a bag of them at £1 and having some for another meal. Taco beans in tomato sauce - 65p - These beans sometimes come up on offer at Tesco of 2 for £1. 4 potatoes for chips - 33p each, so best buy a bag for £1.15. Or if you prefer, buy a bag of oven chips. Tortilla chips - 46p for value which I like, they just are slightly more broken. Otherwise, around £1. £4.11! (£4.65 with more expensive tortilla chips). Peel, chop and boil the sweet potatoes. Whilst they're cooking, add the beans together in a dish you can add a top to, as well as about 1/3 of the spice mix. Mix these all together in the bowl. If you have left over fajita veg, add this to the beans instead of fajita mix. Once the potatoes are soft, mash them. Add the mash to the top of the beans to make a pie. Cook in the oven for around 20 minutes so it's all hot and bubbly. Whilst the pie is cooking. Cook your chips. Once the pie is cooked, serve with chips and nachos. If you have left over wraps, I like to deep fry them in triangles for dipping in the pie. Otherwise the wraps can also be stuffed with the pie and chips. Optional extras - I've had it with and without dips. The pie is saucy on it's own so whilst dips are nice, I don't think they are an absolute must. Here's a pic of the outcome (with dips) using deep fried wraps as I had fajitas yesterday! Sorry the photo is quite close!